New version of Network and IT Management solution, NetSupport DNA, out now! Already helping schools and businesses to manage their technology with ease, plus equip staff with the tools to help them achieve best practice, NetSupport DNA (corporate and education editions) now includes more enhanced and easy-to-use features to maximise the benefits of technology. In addition to providing a single time-based summary of all activity by a specific user, PC or department presented in a chronological view, new enhancements in the Activity Monitoring tool now allow for the data to be viewed in graphical timelines; providing a quicker and easier way to view activity. This time-saving feature means that technicians don’t have to look at each area separately and can instead see the full picture of activity, at a glance, in one location. NetSupport DNA now allows you to create multiple approved/restricted website lists that can be assigned to specific profiles. This means multiple, dedicated internet settings can be applied to specific departments and year groups. Plus, the Counter Terrorism Internet Referral Unit (CTIRU)list has now been included in the restricted list, which can be enabled/disabled. The content from these sites will not be shown when searched for; however, the search terms are recorded to allow the organisation to see what keywords were used. Helping IT staff to resolve issues more efficiently, the new System Error Alerting tool triggers a system error alert to capture an error message (e.g. GPFS) when a system error occurs. The alerts can be configured to take a screenshot, record screen and run an application. This extra functionality has also been applied to PC alerts, allowing you to choose what happens when any alert is triggered. Plus, as the new GDPR requirements come into force in a couple of months’ time, NetSupport DNA now contains a range tools to help schools and businesses meet their GDPR requirements at no extra cost. 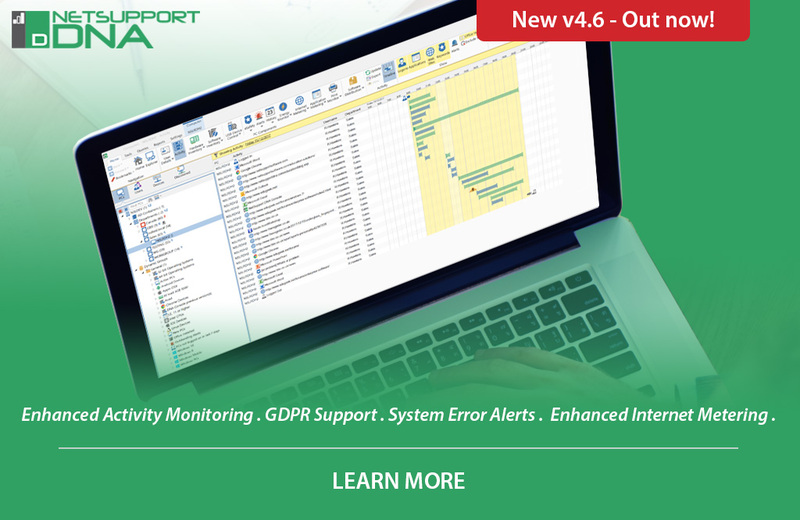 Features include a GDPR software compliancy inventory to support data protection; data discovery tools to help organisations discover information they hold;endpoint security; alerting features to help prevent data breaches; and tools to archive or remove all data history related to a person to support Individuals’ rights. To find out more about the new features for schools click here. To find out more about the new features for businesses click here.